Malesina (Greek: Μαλεσίνα) is a town and a former municipality in Phthiotis, Greece. Since 2011 the local government reform, it became a part of the new municipality Lokroi, of which it is a municipal unit. Malesina is located in the former Locris Province, in south-east Phthiotis. It is at the 125th kilometer of Greek National Road 1. The municipal unit covers the peninsula Aetolimni. The town is surrounded by olive groves, vines and fields. The town was founded by Albanian settlers in between 1466 and 1485. The region of Malesina is known for its clean beaches on the Northern Gulf of Euboea. The majestic bight of Theologos gives fantastic moments with its sunsets. Calm and beautiful the beaches of OSMAES, Vlihada, Lekouna, Arsana, that each year gain the "Light blue Flag" for cleanliness. Scenic, but still difficult to access, the beaches of the Gorgolimano, Papa, Mourtitsa, Mantesiou, Kakailias with the successive alternations of rock and sand. In deserted and majestic beaches of the region, the pine-tree shadow is leaned on the wave. In the other side of the Euboean Gulf is situated, almost vertically, the Kantili mountain of Euboea, cutted, miserable, thinking, after its other piece was destroyed by the humid element before millions of years, wild as mad dog and ready like no other time for fearsome storms with furious norths, that lower through his wild ravines. Euripides knew well how rages the Euboean in front of Kantili, when he wrote in the The Trojan Women the phrase "πλήσον δε νεκρών κοίλον Ευβοίας μυχόν". The region of Malesina has evolved rapidly into an economy based on tourism, because of its landscape and location near to Athens. but also because it possesses fertile grounds, olive groves and a lot of residents are working in the heavy industry of Larco and in new houses construction of the settlement OSMAES. Malesina has a well-studied street-plan of city, with perfect structural blocks, squares, streets straight from one end until the other. The sewer system, as well as the system of biological cleaning shortages are in the stage of their completion. It has 14th-state municipal school, high school, lyceum, kindergarten, day nursery, post-office, banks, cooperatives, athletic associations, grounds, rural surgery, private dental clinic, drugstores and CENTER FOR ELDER CITIZENS. One kilometer out of the city there are the children΄s camps of Ministry of External Affairs, where each summer hundreds of children from the Dissemination are getting entertained. The municipality of Malesina comprises the city of Malesina, the resort of Theologos, the settlement of OSMAES (Building Cooperative of Greek Army lifer Officers) and the villages Proskyna and Mazi. Also in the municipality of Malesina is the Byzantine Abbey/nunnery of Saint George, as well as the archaeological sites of Alai Lokri (in Theologos), Korseias (Chiliadou or Paliokastro Proskyna) and Voumelitea (Chiliadou or Martino). ^ Kramer-Hajós, Margaretha Theodora (2005). 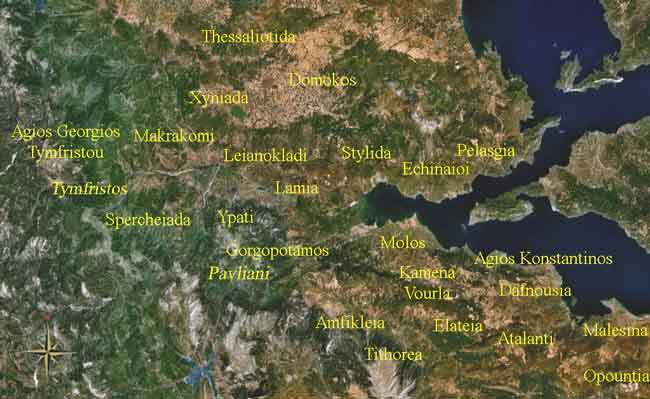 Mycenaean civilization in East Lokris. Cornell University, Jan.. p. 16. Retrieved 20 October 2010. ^ Karpat, Kemal H.; Studies, University of Wisconsin. Center of Turkish (2004). Ottoman Bosnia: a history in peril. University of Wisconsin Press. p. 103. ISBN 9780299207144. Retrieved 20 October 2010.